The digital black market and drugs: do you know where your children are? Unfortunately, this is just the tip of the iceberg where drugs on the Darknet are concerned. 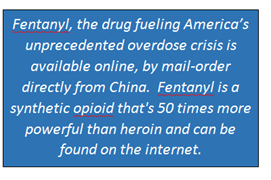 ‘Lesser’ drugs are often laced with a stringer synthetic opioid, fentanyl, which is the fastest-growing cause of overdoses nationwide.18Just a few flakes of fentanyl can be fatal. When it is not fatal, it feeds an opioid addiction (Figure 1). Figure 2 A parent’s role. The founder who yielded over $1.2 billion in sales in less than 3 years, was charged with engaging in a continuing criminal enterprise, narcotics trafficking, money laundering, and computer hacking. He is now in prison for life.25This was followed by the recent takedown of AlphaBay marketplace, said to be ten times bigger than Silk Road.26 The Agora Marketplace is yet another drug sales location on the Darknet. One site goes down, and five more pop up. It is a daunting regulation task for any government. Just yesterday,27 the Department of Justice announced the creation of the Joint Criminal Opioid Darknet Enforcement team or J-CODE, to target the disruption of Darknet drug sales and the destruction of criminal enterprises facilitating trafficking Figure 3. 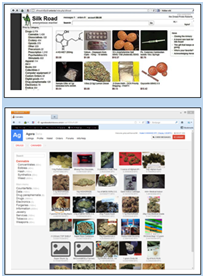 Figure 3 Sample darknet marketplace sites. Although some black market dealers get caught, the Darknet continues to grow and get more sophisticated. The Darknet has revolutionized the drug trade.28 It is no longer a seedy exchange in a dark alley–it’s as easy as buying something on amazon and waiting for it to get delivered by the mailman. This is what we know; deaths from synthetic opioids (fentanyl, carfentanil) have surpassed deaths related to heroin and common prescription opioids such as morphine. Overdose deaths among ages 15-19 have risen 23% between 2015-2017.29 The fastest growing segment of the Darknet drug sales is synthetic opioids. Teens know how to navigate technology. Parents need to stay in touch with technology and their teens to play a part in monitoring exposure to black market drugs. Allen Hoffmann. Before Dark Net Markets Were Mainstream. 2015. Monica Barratt. A Discussion About Dark Net Terminology. Drugs, Internet, Society. 2015. Bartlett J. Dark net markets: the eBay of drug dealing. 2014. Mike Power. Online highs are old as the net: the first e-commerce was a drugs deal. 2013. Deep Dot Web. Updated: List of Dark Net Markets (Tor & I2P). 2018. Plenke M. Inside the Underground Market Where Bodybuilders Find Dangerous, Illegal Steroids. 2015. Paganini P. The Deep Web and Its Darknets. 2015. Power M. Drugs 2.0. ISBN 9781846274619. Van Hardeveld G. Deviating From the Cybercriminal Script: Exploring Tools of Anonymity (Mis) Used by Carders on Cryptomarkets. 2017. Torpey Kyle. Blockchain.info Launches Tor Hidden Service. Inside Bitcoins. 2018. Roger J. Clearnet vs Hidden Services–Why You Should Be Careful. Jolly Roger’s Security Guide for Beginners. Deep Dot Web. NPR Staff. Going Dark: The Internet Behind The Internet. 2014. Gayle D. Online market 'is turning drug dealers from goons to geeks. 2016. Ward M. Tor's most visited hidden sites host child abuse images. 2014. Greenberg A. It’s About to Get Easier to Hide on the Dark Web. Wired. 2017;78–83. Whitaker R. Why I Had to Buy My Wife's Inhaler on the Dark Web. 2015. Wing N. Feds Prepare For A New War On Kratom. 2017. Winder D. Is this new zero-day dark market the real deal? 2015. Compton W. House Committee on Energy and Commerce, Subcommittee on Oversight and Investigations: Darknet Commerce. 2017. Cyber Security Dojo. Romania defending Ukraine's cyberspace. 2015. Popperjune, Nathaniel. Steven Thrasher Teen drug overdose rate in US rose 20% in 2015. The Guardian. 2017;A1–A3. Howell O'Neill P. The uncensored history of the Internet's drug revolution. 2015. Hong N. Silk Road Creator Found Guilty of Cybercrimes. Wall Street Journal. 2015;A1–A4. Weiser B. Man Behind Silk Road Website Is Convicted on All Counts. New York Times. 2015. Howell O'Neill Pk. How the Internet powered a DIY drug revolution. 2013. Leswing K. The FBI just took down AlphaBay, an online black market for drugs that was 10 times bigger than Silk Road. 2017. Bennett Cory. Private 'darknet' markets under siege. 2017. Ingelvaldson D. What’s Lurking in the Deep End of the Internet. Wired. 2015;88–95. Lardieri A. Report: Alcohol, Drug, Suicide Deaths Hit New High. 2018. ©2018 Vayda. This is an open access article distributed under the terms of the Creative Commons Attribution License , which permits unrestricted use, distribution, and build upon your work non-commercially.